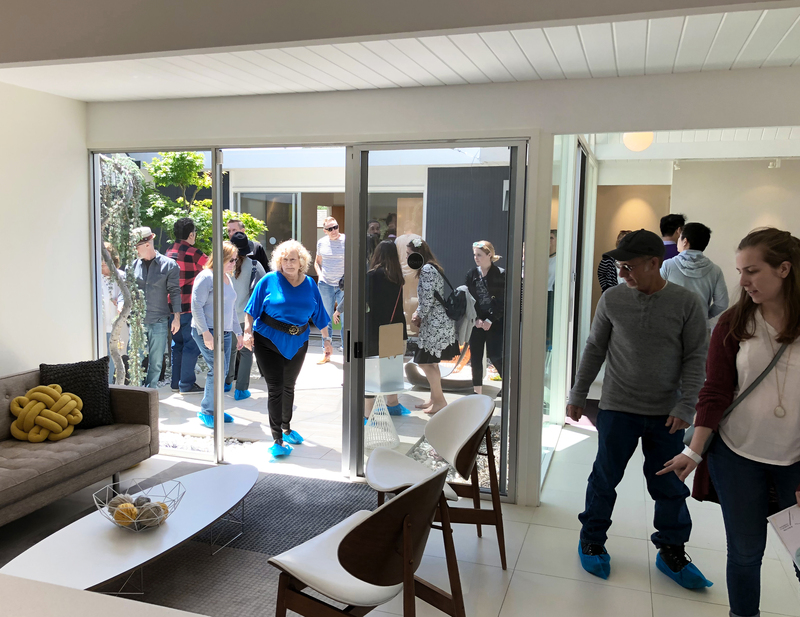 When the '2018 Marin Eichler Home Tour' unfolded last Saturday May 19, the sideshows of proud homeowners, daydreaming visitors, friendly docents, and upbeat vendors presented additional entertainment. But the homes, like the one above on Zephyr Court in Lucas Valley, had the starring role. It all provided an interesting backdrop to a marvelous modernist moment in Marin. 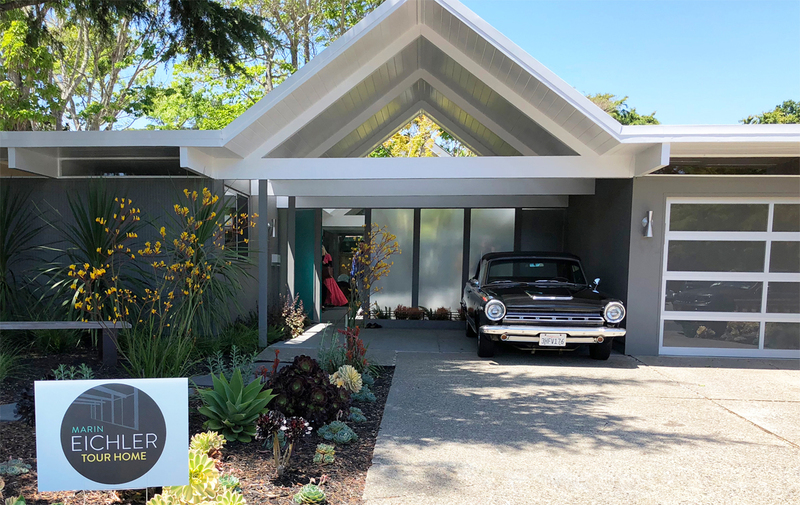 Last weekend's first tour of Marin Eichlers in nine years was a virtual three-ring circus of mid-century mod for the 21st century. In the big top, of course, were the homes, a dozen carefully selected and stunningly presented specimens that took in four distinct Marin neighborhoods—Upper Lucas Valley, Marinwood, and the two Eichler areas in Terra Linda. The homes, most of them extensively remodeled, were set apart by two motifs. There were the sometimes opulent gabled models in Lucas Valley, and the less flashy, mostly smaller homes in Terra Linda. 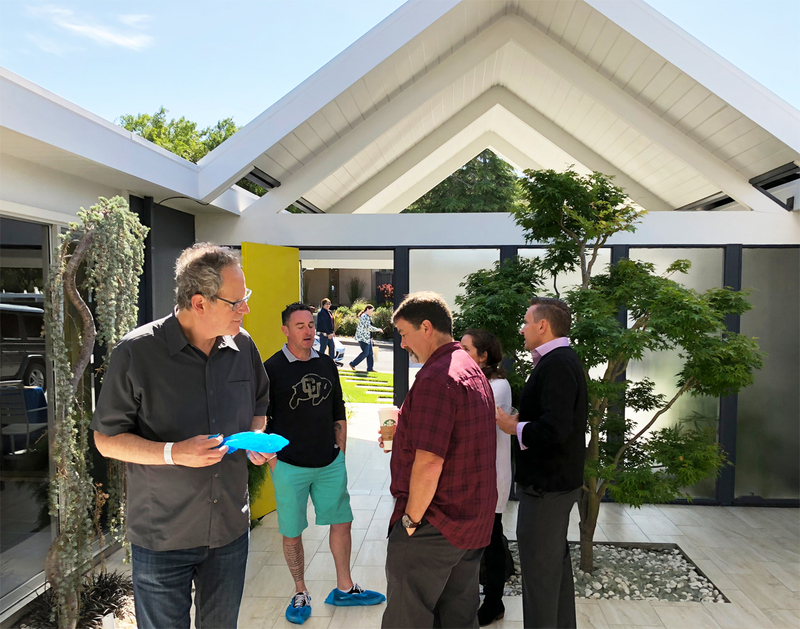 As the '2018 Marin Eichler Home Tour' unfolded, however, the sideshows of proud homeowners, daydreaming visitors, friendly docents, and upbeat vendors presented additional entertainment and even edification. Most of the talk was admiring and positive; some was critical or questioning. It all provided an interesting backdrop to Saturday May 19's marvelous modernist moment in Marin. "All the lights, all the shades—everything—are on timers," Jennifer Carden told visitors to her fully restored and automated 1962 home in Lucas Valley. She added wryly, "I can lay in bed and shut the whole house down. It makes me incredibly lazy." One of the home's five bedrooms on 1,942 square feet features a built-in Murphy bed. Matthew Carden is a toy photographer and collector, necessitating display space on built-in shelves and inside a gorgeous Asian china cabinet. Jennifer said the dining table had a thick marble surface that was cracked when they found it "on the cheap" on craigslist.com, so they replaced it with a striking piece of polished granite. "Oh, good, they did what I want to do," exclaimed a visitor to a 1961 model in Terra Linda, admiring the shower with one glass wall facing a solid fence in a narrow sideyard. That house has a stylish, much admired gas firepit from Poliform in the atrium. A few visitors were heard to privately bemoan an excess of white walls in some models. One notable exception was a flawlessly preserved 1959 Eichler on Anchorage Court in Terra Linda with vibrant Philippine mahogany walls and sliding Shoji screens atop vinyl composite tile flooring—all original. "It was a breath of fresh air," said one visitor, "and really showed how one can impress with simple restoration."